Beginning in France in the late 19th century with the light-filled paintings of impressionists Monet and Pissarro, Landscapes of pleasure also takes in the work of Scottish and English artist-travellers who visited the south of France in search of colour, warmth and luminosity. 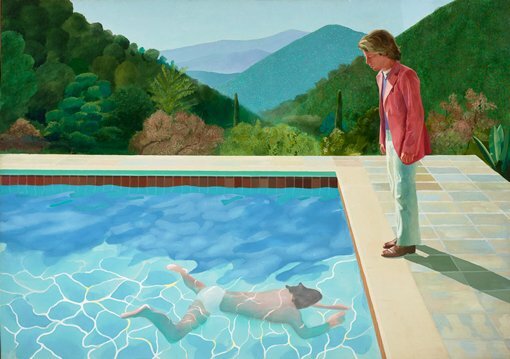 David Hockney’s renowned painting Portrait of an Artist 1972, portraying the delights of southern France but painted in a cramped London studio, offers a grand summation of – and perhaps a farewell to – this paradisiacal tradition. Complementing these views of France are lyrically rendered British landscapes spanning almost a century, from Spencer Gore’s radiant The Icknield Way 1912 and Ivon Hitchens’ Evening pool 1947 to Frank Auerbach’s Primrose Hill, autumn 1984. Women modernists Frances Hodgkins and Winifred Nicholson bring near and far together in their intimate ‘still-life landscapes’. And Hockney appears at grand scale again with the first of his multi-panel landscapes of the 2000s, the collection favourite A closer winter tunnel, February-March 2006.